Sharadchandra Govindrao Pawar aka Sharad Pawar, Hon-Her-Able Agriculture Minister, Government Of India and International Cricket Council or "ICC" President has filed a case today in the Supreme Court against the Accounts Department of the Enforcement Directorate for misrepresentation of his assets in the recently published assets disclosure on the Prime Minister's website. The complaint petition was filed earlier by Lawyer Ram Jethmalani. The case has been gaining momentum and national outrage ever since Pawar's "Self Disclosed" assets were listed as 12 CRORES only. 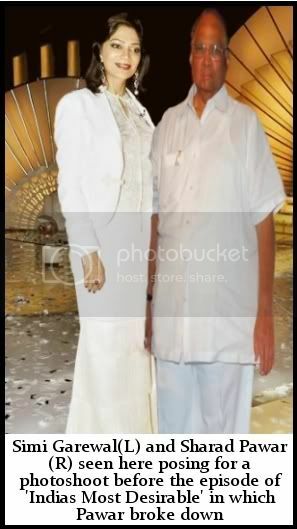 Pawar broke down into tears as he made an appearance on India’s Most Desirable with Simi Garewal. As he wiped his nose on Simi’s White Handkerchief, an emotional Pawar quipped "I am deeply hurt. There is absolutely no recognition of talent in this country. I have dedicated my entirelife towards corruption and to be told that my assets are worth only 12 crore rupees not only deeply hurts me but is also embarrassing. What will all my political colleagues think of me now? They worship me, with what face can I go and stand in front of them with assets listed as only 12 Crores? " "It’s humiliating. I trusted the ED to do a proper valuation of my assets. I have an impeccable track record in the Telgi Stamp Paper Scam, As Food Minister, As Sugar Lobby King, As BCCI and ICC Chief, As Maharashtra Chief Minister, As A Real Estate Developer, I can just go on and on. I have made assets in all these so how can anyone expect to believe that my assets are just worth a paltry 12 crore? THIS IS CHILLAR MONEY.BLOODY EVEN SHAH RUKH KHAN MAKES MORE THAN THIS BY DANCING AT MARRIAGES!!!" Public support for Pawar has been swift and growing rapidly. His struggle for a proper valuation of his assets is soon to be the next big revolutionary movement after the recent Anna Hazare fast at Ramlila Maidan. Pawar too is planning to go on an indefinite hunger strike till his assets are revalued and their correct value is published. Support for Pawar has swelled in colleges and offices throughout India with the energetic youth of the country eagerly backing Pawar. One such young person Anuj Sikander, First Year Student at Arindam Chaudhuri Polytechnic Institute of Chicken Counting energetically screamed amidst thousands of fellow supporters at a planning meet for Pawar's fast “What Sharad Saheb is doing is for the youth of India. It is for the young people like you and me. It is for our future, that’s why we are all supporting him. Today the government is valuing Sharad Sir’s assets at only 12 crore. Tomorrow if I win an election and make assets will they value my assets also for 12 crore? We will not quit till they revalue Sharad Sir's assets. SHARAD PAWAR AAGE BADHO, HUM TUMHARE SAAATH HAIN!!" Sharad Pawar has also become a fashion icon. 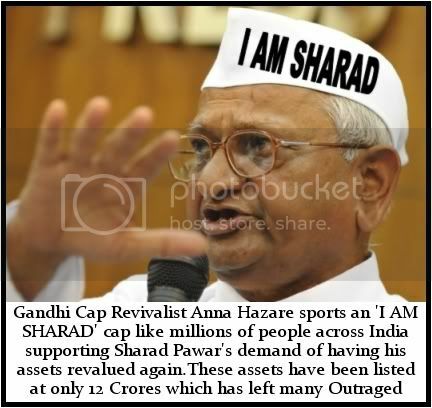 Thousands of people supporting his asset revaluation are wearing the iconic Gandhi cap with the words ‘I AM SHARAD’ transcribed on them. While last week they had written ‘I Am Anna’ on their caps, this week they are writing I AM SHARAD clearly sending a symbolic message to the establishment that they will no longer take the issue of asset undervaluation lying down. Bollywood has also chimed in with support for Pawar. Apart from superstars Fardeen Khan and Esha Deol, Mega Star Salman Khan who is recovering from nerve surgery in the US is also supporting Pawar. 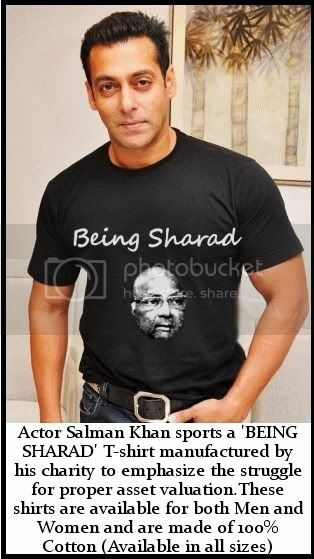 Salman infact has released his own line of t-shirts through his charity in support of Pawar called 'BEING SHARAD'. Can an already tired government afford to further displease an aggravated Sharad Pawar by not agreeing to revaluate his assets especially with an ever increasing mass movement behind him? Can the government salvage this situation somehow by reworking Pawar's 12 crore asset declaration? Keep reading The Jhunjhunwala Times for in depth coverage on Sharad's PAWAR-PLAY.